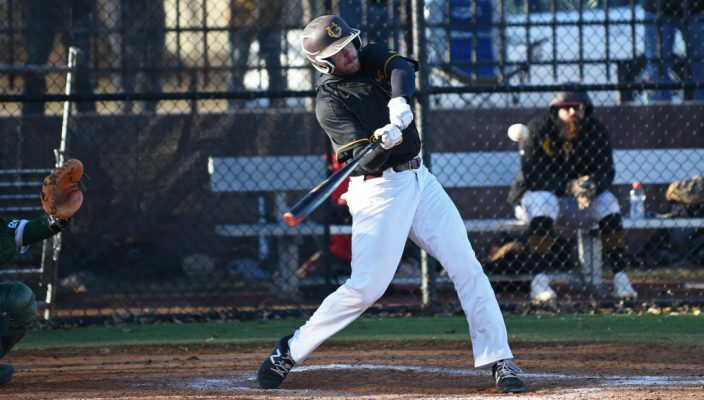 Gannon University’s baseball team opened Pennsylvania State Athletic Conference West play by sweeping Slippery Rock over the weekend to improve on its already hot start to the season. The Knights won the first game of Saturday’s doubleheader at McConnell Family Stadium, 11-6, and then they then took the nightcap 15-9. Gannon followed Saturday’s sweep with another Sunday at Slippery Rock, winning 6-3 and 7-2 to improve its overall record to 14-6 and its PSAC mark to 4-0 going into Friday’s 1 p.m. doubleheader against Clarion at McConnell Family Stadium. Jared Beach got the scoring underway for Gannon in the fifth inning of Sunday’s first game with a solo homer to cut a two-run deficit in half. Later in the same inning Ian Steighner drove in Justin Hamm with a double to tie the game at 2-2. Nate Cardy continued his hot start to the 2019 season, one in which he is hitting just under .400, with a leadoff home run in the sixth inning of game one. Cardy also recorded four hits in game two, which is the third four-hit game of his career, and is leading the team in RBIs so far with 20. No one had more than one hit for Gannon in the first game Sunday, but Beach scored twice. The Knights didn’t need a whole lot of offense, though, as Cory Hegedus went the distance on the mound, tossing seven innings and allowing seven hits and three earned runs while striking out five and walking only one. The Knights kept their bats hot in game two, scoring four runs in the first inning. Elijah Quiceno slugged a two-run home run to key the uprising. Quiceno kept his bat hot in the second inning, driving home Cardy to help his team jump to a 5-1 lead. Hamm opened up the fifth inning with a solo home run to give the Knights a 7-2 lead, one which they would not relinquish for the rest of the game. Eric Sapp and Ty Phelps combined to throw seven innings for Gannon, allowing five hits and two earned runs. Sapp worked the first four and gave up four hits and two runs while walking four and striking out four. Phelps yielded only a single and a walk in his three innings while striking out four. Sapp picked up his third win of the season, while Phelps earned his first save of the year. The Knights have hit 23 home runs this year, which is second in the PSAC, and just one behind Shippensburg. In Saturday’s doubleheader win at home, Ryan Kalbfus swung the big bat as he smacked a single in the second inning and a two-run double in the fifth in the first game. Luke Callahan, Hamm and Kalbfus each had two hits and Steighner added a hit and scored three times. Hamm drove in two and Callahan added an RBI. Deven Judy worked six innings to pick up the win, giving up five hits and three earned runs while walking five and striking out five. In Saturday’s second game, Cardy, Steighner and Dominic Mori each contributed two hits, with Cardy knocking in two and scoring three times and Steighner and Mori each adding an RBI. Quiceno contributed a grand slam for the winners. After Friday’s doubleheader at home against Clarion, the Knights will travel to Clarion on Saturday for another doublheader starting at 1 p.m.